Gillian Curtis is now living with her father, Mike. She hates it there and is planning to run away. Dr. Michael Curtis is the head of YorkCare medical insurance company. He is rich and flaunts it. He cares nothing about his spunky intelligent teenage daughter and, beyond that, he cares nothing about people who need medical insurance. The bottom line (i.e. money) is all that matters. If you are old, or infirm, and need insurance to get the medical care you need…he would rather you die. A real nice guy. Walter Lovett has just lost his wife to cancer. He has been fighting with YorkCare for a long time trying to get the medical care Helen needed to live. Unfortunately, YorkCare took too much time, and Helen died. Walter is pissed and decides to make Mike Curtis pay for what he did. He wants him to suffer, so he decides to kidnap Mike’s precious daughter, Gillian. One night, Gillian slipped out of the house to run away when Walter, not believing his luck, grabbed her. Surprisingly, Gillian was happy and Walter treated her like a daughter should be treated. They hit it off and between them they end up…..oh, I do not want to ruin the book, so you will have to read “Torn Apart” when it comes out everywhere on June 1, 2013. “Torn Apart: The Abduction of Gillian Curtis” is a fast, furious, and fun read. Not to mention scary. 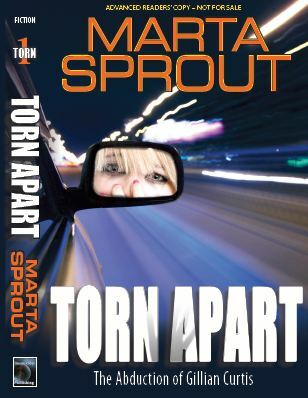 Marta Sprout told me in an email that much of what she wrote about is true! Yikes! “I’m so glad you are enjoying the book. It’s one of those that nearly wrote itself. 1. Yes, yes, and yes. I almost went to medical school, but didn’t because of my concerns over “managed care.” Instead, I was on the front lines of medical management where I routinely faced off with big insurance companies. One of the scariest parts of Torn Apart is how much of the dirty tricks are true. I also have a depth of knowledge from working in Ski Patrol. I’m trained in outdoor emergency medicine. So, if you break your leg on a ski slope or get stuck on a lift, I’m your best buddy. 🙂 I have a son who did three tours in Afghanistan and I have a whole crew of friends who are detectives or police chiefs. And I have a lot of medical folks in my family. 3. Yes, I love dogs. A yellow lab! Give him a belly rub from me. They are so wonderful. 4. Teenagers are so funny and, boy, is she out there. 5. Yes, that is the plan. The book will be released in print and as an eBook on all major outlets. It will be available through the usual distributors for booksellers (Baker & Taylor and Ingram’s.) Online it will be available at Amazon, Barnes & Noble, iBooks, Sony, Kobo, Diesel, etc. There will be two give-away contests with GoodReads and a marketing campaign to get the word out. Should be fun.